The invasive knotweed complex is a group of tall, rhizomatous, perennial plants in the Polygonaceae family. Plants range in height from about 5 feet to more than 20 feet. There are four highly invasive species typically included in the complex including Japanese knotweed (Fallopia cuspidatum); giant knotweed (Fallopia sachalinense); Bohemian knotweed (Fallopia x bohemicum), a hybrid between giant and Japanese knotweed; and Himalayan knotweed (Persicaria wallichii) [See Knotweed Names, below]. Recent genetic studies have found that Bohemian knotweed is the most widespread knotweed in the West [See Bohemian Knotweed Wins the West, below]. Knotweed is an herbaceous plant producing new shoots each year from rhizomes and crowns. Shoots emerge from mid-spring to late summer and may not be hollow until they mature. Following emergence, plants can grow two to four inches per day. Flowering occurs from August to September, with fruit set beginning in September. Above ground growth (stems and leaves) is not frost tolerant and dies at first frost. Dead canes (stems) often remain upright throughout winter. The four invasive knotweed species can be distinguished from each other by physical differences summarized in Table 1, and variation in leaf shape and hairs on the underside veins of leaves shown in Figure 1. Himalayan knotweed leaves are narrow (its width is less than half its length), distinguishing it from giant, Japanese and Bohemian knotweeds, which have leaf widths more than 2/3 their length. The leaf base of giant knotweed is deeply heart shaped compared to the base of Japanese knotweed, which forms a right angle with the leaf stem. Bohemian knotweed’s leaf shape is variable and may resemble either parent (giant or Japanese knotweed). Small stout hairs on the underside leaf veins distinguish Bohemian knotweed from the multi-cellular hairs on giant knotweed veins, and the rough ridges (but absence of hairs) on Japanese knotweed veins. A magnifying glass or hand lens is needed to see diagnostic features on leaf veins. If you find a mystery plant that you can’t identify by vegetative characteristics, contact John Gaskin at Sidney, Montana, USDA-ARS (john.gaskin@ars.usda.gov), to discuss whether the plant is candidate for DNA identification. A cut stem landing on moist soil or grass can develop root and shoots forming a new plant. In all four knotweed species, reproduction is primarily vegetative by rhizome fragments. Movement of fragments occurs when a patch is excavated and moved, or when rhizomes from plants growing along a riverbank break off and float downstream. Even very small fragments that have a node present can regenerate a new plant. Rhizomes have been observed to emerge through two inches of concrete and burial of more than three feet. Stem fragments can also serve as a mode of spread. A cut stem landing on moist soil or grass can develop root and shoots forming a new plant. Once a knotweed rhizome fragment, stem section, or seed (least common) lands on a suitable site, the weed can grow rapidly. Underground rhizomes can grow 50 to 65 feet laterally and produce new shoots. Preventing knotweed establishment is the highest priority for management. Once established, eradication is extremely difficult. Knotweed control efforts will typically require a combination of treatments over multiple years. Dr. Mark Renz, University of Wisconsin conducted field trials near McFarland, Wisconsin to study the efficacy of various herbicide treatments in combination with mowing on Japanese knotweed. Treatment combinations included: 1) mowing once followed by herbicide treatments in summer; or 2) mowing twice followed by herbicide treatments in fall. Knotweed regrowth was 2 to 3 feet tall at time of application and plots were arranged as a randomized complete block with three replications. Results of the studies indicate that mowing twice followed three months later by a fall herbicide application provided significantly greater control than mowing once followed by a summer herbicide application applied only six weeks after mowing (Table 2). Milestone® herbicide at both rates applied, and Capstone® herbicide provided excellent control when applied in fall three months after mowing. Arsenal* is a non-selective herbicide which controls both grass and broadleaf plants, so revegetation following application is critical. Maintaining or restoring desirable vegetation on infested sites will reduce the potential for knotweed re-invasion. TABLE 2. Percent Japanese knotweed control 10 or 12 months after treatment (MAT) with herbicide and mowing treatments applied in summer or fall at McFarland, Wisconsin. BEFORE AND AFTER. Japanese knotweed plants were mowed in summer and treated with Milestone herbicide at 13 fl oz/A in the fall (left) when plants were 3 to 4 feet tall. These treatments provided good to excellent control 10 months later (right). Figure 2. Bohemian knotweed control with Milestone® herbicide at 7 and 14 fl oz/A at three application volumes. Herbicides were applied to knotweed in late May (3 to 4 foot plant height), and data shown is about 6 months following treatment. Field trials on Bohemian knotweed conducted by Dr. Kim Patten, Washington State University showed that Milestone at 14 fluid ounces per acre (fl oz/A) provided good to excellent control especially with application volumes of 100 gallons per acre (gpa) or greater (Figure 2) when the plants were 3 to 4 feet tall (earlier in the season than the typical timing with other herbicides). Multiple applications will be necessary to provide long-term control. In summary, optimum suppression of invasive knotweeds with Milestone® is obtained when applications are made to plants that are at least 3 to 4 feet tall. Results of field trials conducted in the western United States indicate that high volume applications (100 gpa or greater) of Milestone at 7 fl oz/A or a spot treatment rate up to 14 fl oz/A1 applied in summer will provide good control of invasive knotweeds. In the upper Midwest, mowing in summer followed by fall application of Milestone herbicide (prior to frost) provided the best control. Infestations of invasive knotweed that are mowed should be allowed to regrow to at least 3 feet in height prior to herbicide treatment. Monitoring and follow-up herbicide treatments on regrowth will be necessary to control resprouts and achieve long-term control. Stem cutting, mowing, and digging are effective on small, newly established infestations. These methods must be repeated at least three times during the growing season and continued for more than three years for successful control. Tillage is not effective and will increase spread of root or stem fragments that can start new plants. Covering plants with heavy black plastic or other barrier can be used on small infestations. The covering must be left in place for more than one year. Rhizomes may remain dormant for up to 20 years, so the lack of regrowth in years following removal of the covering does not mean the plant is dead, and regular monitoring is required. Livestock will graze young shoots of the plant and intensive grazing may reduce density and competitive ability of the plant. Long term monitoring and follow-up treatment is necessary for many years to eradicate invasive knotweeds. Infestations that are successfully controlled should be revegetated with appropriate species if desirable vegetation is not returning naturally. 1Milestone may be applied as a spot treatment rate of 14 fl oz/A per growing season; however not more than 50 percent of an acre can be treated at this rate. The University of Idaho, Oregon State University, and Washington State University spearheaded the collection of 865 knotweeds from 132 populations across the western United States and Canada. Samples were sent to the USDA-Agricultural Research Service station in Sidney, Montana for DNA analysis. Results of the cooperative study showed that 72% of knotweeds sampled were the hybrid Bohemian knotweed, making it the most common knotweed species in the West. [Gaskin, J. pers. comm]. MAP OF KNOTWEED COLLECTIONS from western North America. Plant Species are indicated by symbols (Gaskin). Gaskin, John. 2013. USDA, ARS Sidney, MT. Personal communication. Gaskin JF, M Schwarzländer, FS Grevstad, MA Haverhals, RS Bourchier, and TW Miller. In Review. Extreme differences in population structure and genetic diversity for three invasive congeners: knotweeds in western North America. Miller, T.W. 2002. 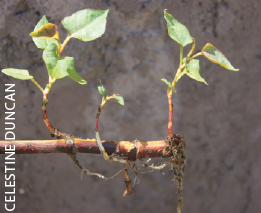 Vegetative reproductive potential of Japanese knotweed (Polygonum cuspidatum). Weed Science Society of America, Reno, NV, WSSA Abstracts 42:61. Patten, Kim. Washington State University. Personal communication. Renz, Mark. 2013. Univ. of Wisconsin-Madison. Personal communication. State restrictions on the sale and use of Milestone and Capstone herbicide apply. Consult the label before purchase or use for full details. When treating areas in and around roadside or utility rights-of-way that are or will be grazed, hayed or planted to forage, important label precautions apply regarding harvesting hay from treated sites, using manure from animals grazing on treated areas or rotating the treated area to sensitive crops. See the product label for details. Milestone is not registered for sale or use in all states. Contact your state pesticide regulatory agency to determine if a product is registered for sale or use in your state. Herbicide products (active ingredients) mentioned in this article include Milestone (aminopyralid), Arsenal* (imazapyr), and Capstone (aminopyralid+triclopyr amine).